Thank you for choosing BT Computers for your computer service needs. A free program called BT Online Monitor is included as part of our service. The program will alert you to any issues that may arise with Your PC. BT Online Monitor also allows you to quickly get in touch with us when needed. Here is an example of an alert. 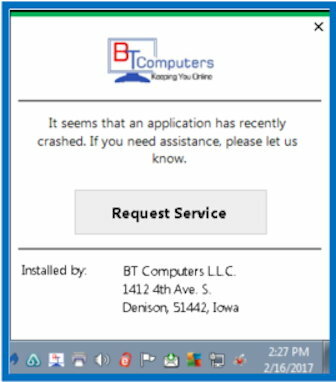 If BT Online Monitor finds an issue, it will notify you so you can take care of the issue yourself, or contact us for service. To immediately contact us for help, click Request Service and enter your contact information. We’ll get in touch with you to discuss the best possible solution.